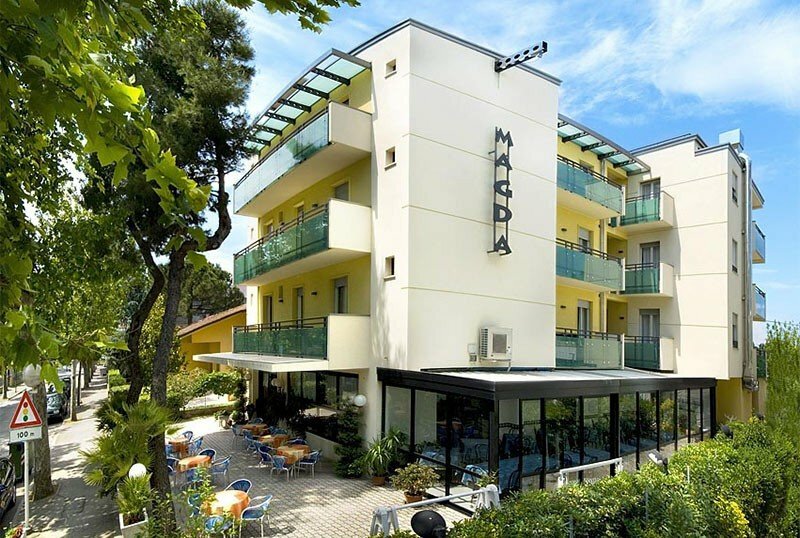 The Hotel Magda , 2 stars in Riccione, is a family-run property located in a quiet area. It offers guests the entrance to the water park of the water springs of Riccione and has free parking, services for the disabled, traditional cuisine with the possibility of vegan menus and for celiacs on request. Accept small animals. The hotel is located in Riccione, about 5 minutes walk from the beach and the spa. Not far away are a Luna Park, a minigolf ideal for families and the Cetacea Foundation that organizes initiatives for children. The rooms have a balcony, satellite TV, WI-FI, private bathroom with box or shower curtain, hairdryer, safe and telephone. Upon request and payment: minibar and air conditioning. FAMILIES: available rooms for families. Garden terrace, open-air porch, free bicycles, large living room, satellite TV, bar, elevator, beach towel on request. PARKING: private, fenced and free subject to availability. AIR CONDITIONING: in the common areas. CONVENTIONS: beach, amusement parks, Riccione thermal baths with free admission to the Perle d'Acqua park. On request: shuttle service, organized excursions. SERVICES FOR DISABLED: entrance on the ground floor, lift suitable for disabled people, rooms with adequate wheelchair maneuvering space and bathroom with shower chair and wheelchair-accessible shower. BREAKFAST: buffet with sweet and savory dishes. LUNCH AND DINNER: traditional cuisine prepared by the owners, with 3 menus followed by a buffet of vegetables, fruit and desserts. Pasta and desserts are homemade, water with meals is included. VARIATIONS: on request vegan cuisine and for celiacs. In hotel: strollers, evening entertainment. On request: baby sitter and pediatrician service. At meals: high chairs, baby menu, baby food. At the beach: baby park, live entertainment. The Hotel has an agreement with the bathing establishments from no. 38 to n. 44. At guests' disposal: relaxation area with library and magazines, disabled facilities, mini club with entertainment, WI-FI, baby park, playgrounds (beach volleyball, beach tennis), gym, area reserved for animals. From € 138.00 per person! To spend a mini holiday in peace! Limited offer: take this opportunity! For a holiday full of convenience! From € 340.00 per person! Last call to enjoy the beautiful season, contact us!